The National Siamese Cat Club (NSCC) is a CFA (Cat Fanciers Association) affiliated breed club founded in 1946. The principle objectives of the club, as stated in our constitution, are the promotion of breeding Siamese to the CFA standards and the protection of the breed’s purity. We are also dedicated to developing friendship and sportsmanship among Siamese fanciers, to promoting the breed through sponsorship of cat shows, exhibits, displays, breed booths and awards and to the welfare of all cats. The NSCC organizes and produces an annual allbreed cat show. Although the show has occurred at different times and in different cities over the years, recent shows have been in Brockport (near Rochester) New York. For more information about our next show and to read reports from previous years, go to the Annual Show page in the menu. 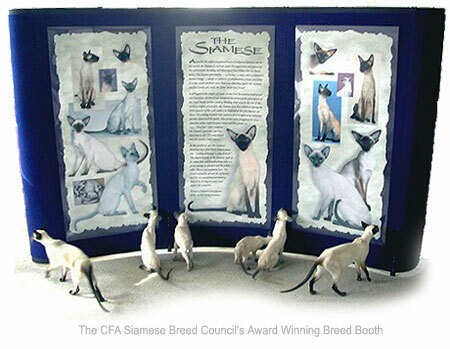 The Siamese breed was recognized by CFA in 1906 - the same year that CFA itself was formed. The present breed standard was written in 1966 by Jeanne Singer and has remained virtually unchanged since that time. To read descriptions of Siamese from the 1800's and see Siamese standards from over the years, see the article Siamese Standards - A Retrospective by Betty White. Presently, CFA is one of the only cat registries in the world to recognize the Siamese as a breed, in its four original colors, and the NSCC is dedicated to promoting and preserving this traditional version of the breed. We firmly believe that pointed cats born in litters from breeds developed from Siamese are not true Siamese. These cats have both Siamese and other breeds as ancestors in their pedigrees and are considered hybrids, although they often look similar to Siamese. The Siamese cat is one of the world’s oldest breeds, with a unique history worth preserving. Not only does its color pattern make the Siamese easily recognizable, but since the original cats were imported in the 1890’s, the Siamese has been noted for its elegance, refinement, length of body, almond shaped deep blue eyes, and wedge shaped head, as well as for its vocal range and its people friendly attitude. The Siamese breed is often described as a “dog without all the work”, and it lives up to its reputation. 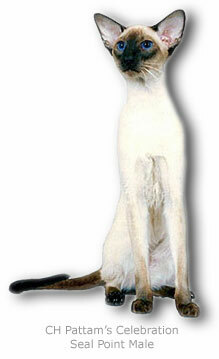 The NSCC is dedicated to preserving the Siamese breed for all of its traits. While the Siamese cat is often defined by its color, color is only one of the qualities the breed is famous for. Our club is international, with members across North America and even Europe. We welcome membership applications from people who share our goals and vision of the breed. For information about joining the club, please visit our Membership page. NSCC membership also includes a subscription to our newsletter which is published three times a year and covers a range of topics including articles about top winning Siamese, health issues and the breed in general. Learn more about membership and joining NSCC .Those of you who are interested in learning more about the Siamese and/or who want information about acquiring a Siamese kitten should visit our About Siamese, Breeder Directory and Articles pages.